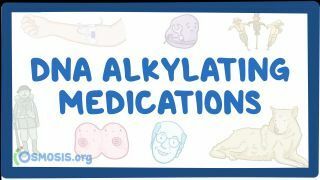 Osmosis: DNA Alkylating medications. (2019, April 20). Retrieved from (https://www.osmosis.org/learn/DNA_Alkylating_medications). Cyclophosphamide is a medication mainly used in chemotherapy. It is an alkylating agent that interferes with DNA replication by forming intrastrand and interstrand DNA crosslinks. Cyclophosphamide is used to treat solid tumors, leukemias and lymphomas, as well as autoimmune diseases. Side effects include myelosuppression as well as hemorrhagic cystitis, which is prevented with coadministration of mesna. An alkylating antineoplastic agent is an alkylating agent used in cancer treatment that attaches an alkyl group (CnH2n+1) to DNA. Busulfan is a cell cycle non-specific alkylating antineoplastic agent, in the class of alkyl sulfonates. Carmustine (bis-chloroethylnitrosourea, BCNU, BiCNU) is a medication used mainly for chemotherapy and sometimes for immunosuppression before transplant. It is a nitrogen mustard β-chloro-nitrosourea compound used as an alkylating agent. As a dialkylating agent, BCNU is able to form interstrand crosslinks in DNA, which prevents DNA replication and DNA transcription. Ifosfamide is a nitrogen mustard alkylating agent used in the treatment of cancer. Its mechanism of action is by cross-linking DNA at guanine N-7. It requires bioactivation in the liver. Its major toxicity is hemorrhagic cystitis, which can be prevented by the coadministration of mesna. Streptozotocin is a naturally occurring chemical that is particularly toxic to the insulin-producing beta cells of the pancreas in mammals. It is used in medicine for treating certain cancers of the Islets of Langerhans and used in medical research to produce an animal model for hyperglycemia in a large dose as well as Type 1 diabetes with multiple low doses. Lomustine (INN), also called 1-(2-chloroethyl)-3-cyclohexyl-1-nitrosourea (CCNU) (trade name CeeNU in the U.S.) is an alkylating nitrosourea compound used in chemotherapy. It is closely related to semustine and is in the same family as streptozotocin. It is a highly lipid-soluble drug and thus crosses the blood-brain barrier. This property makes it ideal for treating brain tumors, which is its primary use. Lomustine has a long time to nadir (the time when white blood cells reach their lowest number). Semustine is a drug used in chemotherapy. It is structurally similar to lomustine, being distinguished from it only by an additional methyl group. It has been taken off the drug market for investigation of its cancerous effects, rated as IARC Group 1 carcinogen or a known carcinogen. Cyclophosphamide is an alkylating antineoplastic medication which is also carcinogenic and may increase the risk of of the bladder. A 5-year-old boy comes to the office because of red urine for the past six hours. He is currently being treated for acute lymphoblastic leukemia with chemotherapy that includes ifosfamide. His last dose of this round of chemotherapy was 48 hours ago. His temperature is 36.8°C (98°F), pulse is 87/min, respirations are 18/min, and blood pressure is 117/78 mm Hg. Urine sample shows macroscopic hematuria. Which of the following medications could have most likely prevented this adverse effect of treatment?